We’re hot off the heels of President Donald J. Trump’s magnificent introductory speech at the UN assembly. But, during his first UN assembly speech on the 19th of September in New York City, he called out the problems within the UN that have been going on for decades, he called out Kim Jung Un as a “Rocket Man” who’s on a literal suicide mission, Islamic extremism being the greatest threat to the world currently, political correctness and socialism being a major failure, as well as endorsing nationalism (i.e basically sticking his finger up to globalism, the establishment, and the corruption within it) which also got a huge round of applause. Plus, let’s not forget the calling out of the terrible US deal with Iran and how they use their resources to fund terrorist organisations like Hezbollah, amongst others. Don’t believe us? Check out his full speech right down there. Some may not think it, but it’s just what the world needs to hear right now. Never has there been a man in office anywhere who’s only intention is to do good, which is joyous for us to witness. It is undeniable that Donald J. Trump is garnering further and further support from world leaders, despite a worldwide media smear campaign against him, but not even world leaders are privy to such false media reporting, nor is the public any longer, (apart from those paid Antifa idiots). With many world leaders hailing him a hero from all sides, he’s most definitely staking his claim to be the leader of the free world, as he should be as President of the United States of America and he well and truly is already. As the wise man Anthony Scaramucci once said: “Donald Trump has very good karma”. With strong speeches like this, his karma and will for good, will only increase, as will his support, as President Trump only speaks truth, which is hard for some people to handle. In following his example, it will help other world leaders to start being honest, not only with their countries, but also in being brave enough to emulate him by waking up, encouraging real change and shunning things such as political correctness in the face of well-known disasters such as radical Islamic extremism/terrorism, illegal mass immigration and out of control migration from unassimilated Muslim countries. Remember, he said all of this right in front of all the world leaders, specifically (and presumably) towards the leaders of countries like Saudi Arabia. The face of the Saudi Arabian UN spokesman said it all… He definitely knows that Trump knows a lot about the world. Additionally, he praised Muslim nations such as Jordan, Turkey, and Lebanon for hosting refugees from the Syrian conflict, unlike Iran and Saudi Arabia. Just last week in London, there was another terror attack, this time on the Tube at Parsons Green. The faulty IED exploded on a packed morning train, injuring some 30 people with flash burns. Had the device worked as intended, it would’ve been much, much worse. As Donald J. Trump has been saying for a long while now, a lot more work has to also be done on the Internet and by Silicon Valley to police and remove Islamic extremist content. Theresa May and Donald J. Trump met yesterday and held a meeting of the minds in which they spoke heavily on the threat of domestic and worldwide Islamic terror threats. Theresa May has since called for more stringent removal and policing of extremist Islamic terror content on the world wide web, probably unlike what the meek London Mayor Sadiq Khan would prefer, which is more policing on Twitter for anti-muslim rhetoric and “hate speech” amidst so many terror attacks across the United Kingdom and in Europe. Bloody socialist! How long until people stop listening to what Sadiq Khan has to say? A day after Theresa May had met Donald Trump, it was her turn to take the stage. She, being the other leader of the free world, staked her claim to logic in a looney politically correct world on the biggest political stage. Needless to say, she didn’t disappoint. “Enough is enough – we’ve all seen too many innocent people murdered” she stated in reference to Islamic terror. During her speech, she encouraged world leaders of all nations to do more to police the internet in removing extremist content from the web. Finally, Theresa May can speak her real views without the socialist media cry babies trying to meddle and slide political correctness into the frame of well-known threats to the people of the United Kingdom, let alone the whole world, (though most notably Europe nowadays). We have all witnessed these threats unfold after catastrophic mass immigration was introduced, which has since been encouraged by weak and backwards socialist nations like Germany and Sweden. Should we mention NGO aficionado George Soros while we’re at it? Oh wait, we just did. 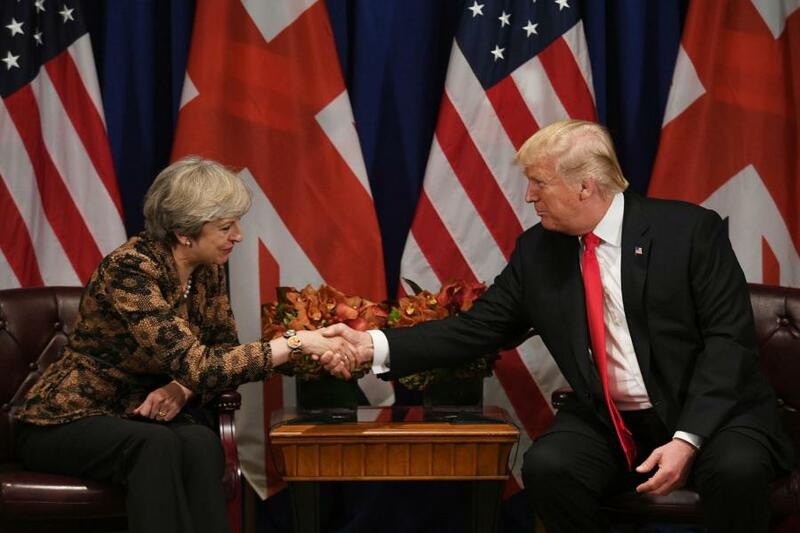 Naturally, Theresa can now follow the brave benchmark of Donald J. Trump’s earlier speech at the UN and make big steps forward. We all need less political correctness, less socialism, and less idiocy in the face of grave danger, the biggest threat currently being terrorism by Islamic extremists and economic migrants from the Muslim world, which breeds economic inequality in the face of a destructive socialist ideology that is a major failure. Please watch Theresa May’s great speech below. We applaud her for coming out and speaking on what needs to be said. We want her to do more as Prime Minister to protect the United Kingdom, whilst she also irons out a great Brexit deal. We hope this signals the start of a shift in the world. Nobody in their right mind can continue to deny the obvious global threats discussed at the United Nations, we believe that now is the time for the world to toughen up. So, with Trump and May at the helm, things should go exactly as planned, even if other leaders like Angela Merkel and Emmanuel Macron remain pawns to evil and continue to be deluded and generally unhelpful on these important factors. So, we hope you enjoyed this easy to read summary and analysis from progress at the UN assembly.